NCERT Textbook Solutions are considered extremely helpful when preparing for your CBSE Class 8 Science exams. TopperLearning study resources infuse profound knowledge, and our Textbook Solutions compiled by our subject experts are no different. Here you will find all the answers to the NCERT textbook questions of Chapter 7 - Conservation of Plants and Animals. All our solutions for Chapter 7 - Conservation of Plants and Animals are prepared considering the latest CBSE syllabus, and they are amended from time to time. Our free NCERT Textbook Solutions for CBSE Class 8 Science will strengthen your fundamentals in this chapter and can help you to score more marks in the examination. Refer to our Textbook Solutions any time, while doing your homework or while preparing for the exam. (i) It is an area within which animals are protected from possible dangers such as hunting. Their habitat is also conserved in this area. (i) It is a large protected area constructed for the conservation of biodiversity. (ii) It provides protection and suitable living conditions to wild animals. (ii) It helps in the conservation of various life forms such as plants, animals, and micro- organisms. (iii) Pachmarhi sanctuary is a wildlife sanctuary. (iii) Pachmarhi biosphere reserve is a popular biosphere reserve. Concept insight: List the differences between wildlife sanctuary and biosphere reserve. (i) It is a facility in which animals are kept for public exhibition. (ii) It is an artificial habitat. (ii) It conserves the natural habitat of animals. Concept insight: List the differences between zoo and wildlife sanctuary. (i) It is a population of species that is on the verge of becominq extinct. (i) It is a population of species that no longer exists, Hence it is extinct. (ii) Blue whale, tiger, leopard, etc. are examples of endangered species. (ii) Dodo, passenger pigeon, etc. are examples of extinct species. Concept insight: List the differences between endangered and extinct species. (i) It refers to all living plants in a particular area. (i) It refers to all animals living in a particular area. (ii) Sal, teak, mango, etc. form the flora of Pachmarhi biosphere reserve. (ii) Leopard, wolf, wild dog, etc. form the fauna of Pachmarhi biosphere reserve. Concept insight: List the differences between flora and fauna. (a) Effects of deforestation on wild animals: Due to deforestation forests are vanishing due to which animals are loosing their natural habitat. Therefore their population is declining rapidly. Concept insight: Deforestation leads to the loss of habitat of wild animals. i.Balance of carbon dioxide and oxygen has been disturbed. ii.It has also changed rainfall distribution at many places. iii.Due to it amount of carbon dioxide has increased in environment due to which global warming has increased. Concept insight: Deforestation leads to global warming and thus affects environment. Roots of plants hold soil particles together. In the absence of plants, the top layer of the soil will be easily removed by the action of high speed winds or water flow. Thus, deforestation increases the chances of soil erosion. As a result, soil loses humus and becomes less fertile. Hence, a fertile land gets converted into a desert. Concept insight: Due to deforestation soil erosion has increased and soil is loosing its fertility. Deforestation in cities can increase the risk of many natural calamities such as floods and droughts in that area. Also, it can lead to global warming due to an increase in the level of CO2 in the atmosphere as a result of vehicular and industrial pollution. This increase in temperature can disturb the natural water cycle of an area. Concept insight: Deforestation has increased global warming. As a result of deforestation, chances of desertification, droughts, floods, etc. increase. Deforestation can also increase the level of CO2 in the Earth. It will lead to an increase in temperature i.e., global warming. As a result, the entire natural water cycle will get disrupted. This again increases the risk of natural calamities. Concept insight: Deforestation has disturbed the ecological balance. Deforestation is slowly changing our environmental conditions. It is responsible for global warming, soil erosion, greenhouse effect, drought, floods, and many other global problems. As a result, the next generation will have to face severe consequences of deforestation. Concept insight: Deforestation has many effects on ecosystem and leads to global problems. (a) If we go on cutting trees, the natural habitat of many animals will get completely destroyed. it will have the following consequences. i. Ecological balance will be disturbed. ii. As a result, the biodiversity of many areas will be severely affected. iii. Also, there will be an increase in the temperature of the Earth as a result of global warming, which can disturb the natural water cycle. As a result, there will be a change in the rainfall pattern. This could lead to floods or droughts. This will also increase the risk of soil erosion, desertification, and natural calamities. (b) The habitat of an animal provides it with necessities such as shelter, food, and protection. If the habitat of an animal is disturbed, then it will be forced to go to other places in search of food and shelter. The animal could get killed by other animals in this process. This will ultimately become a major threat to the biodiversity of earth. Concept insight: List the consequences of deforestation. (a) Biodiversity refers to the number and variety of various life forms such as plants, animals and micro-organisms in an area. Plants and animals depend on each other for survival. This means that the destruction of either of the two will affect the life of the other. Hence, we need to conserve biodiversity to maintain the balance of nature. Concept insight: Biodiversity also maintains ecological balance which is necessary for our survival. (b) Protected forests are not completely safe for wild animals because people who live near or adjacent to forests use resources from forests to fulfill their own requirements. In this process, wild animals are killed and sold for lucrative amounts of money. Concept insight: Animal poaching is done and government takes no action against poachers. (c) Some tribals are dependent on forests as they provide them shelter, food, etc. They also collect wood and herbs from forests. Concept insight: Recall the concept of conservation of forests. (i) Forests are cleared for accommodating expanding urban areas and for fulfilling their ever-increasing requirements. (ii) Forests are destroyed to clear land for crops and cattle grazing. (iii) Trees are cut down to be used for firewood. Concept insight: List the factors that leads to deforestation and its consequences. (e) Red Data Book is a source book that maintains an international list of all endangered animal and plant species. This book is maintained by IUCN (International Union for Conservation of Nature and Natural resources). Concept insight: Red Data Book maintains the account of endangered animal and plant species. (f) Migration refers to the movement of an organism or a group of organisms from its natural habitat to another place at a particular time every year. Organisms migrate from one place to another to avoid inhabitable climatic conditions or for breeding. Concept insight: Migratory birds fly to far away area every year during a particular time because of climatic changes. No. It is not at all justified to cut trees to meet the ever increasing demands of human population. Forests are the habitat of several organisms including wild animals. They provide us with good quality air as they give out O2 and absorb the harmful CO2 gas from the atmosphere. In this process, they prevent the excessive heating of the atmosphere. They prevent soil erosion and natural calamities such as floods and droughts. They increase the fertility of the soil and help to conserve biodiversity. The cutting of forests to meet the demands of growing human population will lead to global warming, soil erosion, greenhouse effect, droughts, floods, and many more problems. The destruction of forests will disturb the balance of nature. Hence, forests must be conserved. Concept insight: If all the forests got destructed we will also not be able to survive. i. I can help in maintaining the green wealth of my locality by taking care of the plants and trees growing in or around my locality. I can plant more and more number of trees. ii. I can also encourage the people in my locality to plant more trees by informing them about the importance of growing trees. iii. I can make young children aware of the effects of deforestation and its effect on our environment and on our planet. iv.I can also ask them to water the plants daily which will take very little of their time. I believe planting new trees is as important as taking care of the existing trees. Concept insight: List the importance of flora. Deforestation is the removal of trees or other vegetation from an area for industrial, agricultural, or other purposes. Plants or trees absorb CO2 from the atmosphere. If plants are destroyed, then the level of CO2 in the atmosphere will rise. The high levels of CO2 in the atmosphere will trap more heat radiations, leading to global warming. This increase in temperature of the Earth will disturb the natural water cycle. As a result of disruption in the water cycle, there will be a change in the rainfall pattern. The reduced amount of rainwater can cause droughts. Concept insight: Large amount of water vapours are added by forests in atmosphere by transpiration. Increasing global warming has disturbed rainfall patterns. An area strictly reserved to perserve flora, fauna, landscapes and historic objects existing in the area is callec a national par. 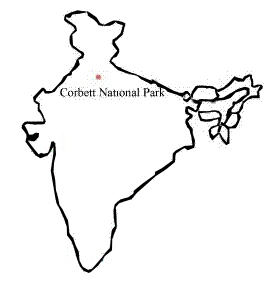 One of the nation parks located near Delhi is the Corbett Nation Park. (i) Collect the used paper and recycle it. (ii) Use both sides of a paper for writing. (iii) Spread awareness about the importance of paper. Concept insight: Trees are necessary for our survival as they provide food, oxygen and maintain water cycle. Concept insight: Recall all these definitions as these are important from Exam Point of View. TopperLearning provides step-by-step solutions for each question in each chapter in the NCERT textbook. Access Chapter 7 - Conservation of Plants and Animals here for free.